The Innisfail Temple welcomes all community members from near and far, who wish to reflect in the reverence and tranquility offered within the Temple. 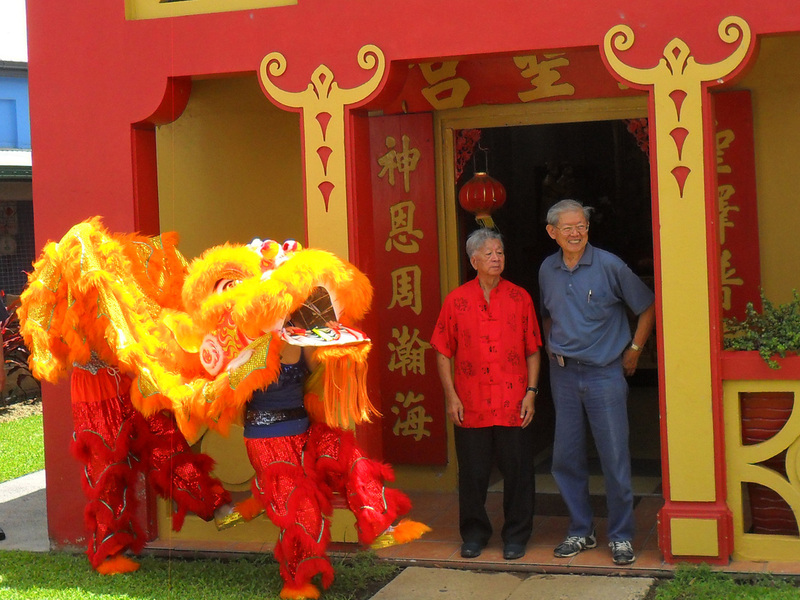 Two of the office-bearers of the Innisfail Temple, pictured at the entrance of the Temple with festive dragon, are Mr. Neville Lee and Mr. Bill Sue Yek (right - retired). The spiritual philosophy going forward, is that the Innisfail Temple should not only maintain the Taoist, Confucian and Buddhist Traditions of its origins, but additionally the Innisfail Temple must endeavour to encompass all belief systems and ethnicities. Activities of Mind, Body and Spirit are valued! The ancestors of the human race have roamed this Earth for more than two million years. The Murri peoples have been settled in this part of Australia for tens of thousands of years. It is possible that the Chinese visited Australia as early as the year 1421 (refer to the link to 1421 on the Contacts page). Captain James Cook sailed by in 1770, paving the way for the First Fleet (from England) and settlement in Sydney in 1788. Far North Queensland is a very special part of Australia. It is lush and Tropical with green intrusive mountains complementing the adjoining blue-water Great Barrier Reef. Innisfail is situated in the heart of Far North Queensland, and it is to this area that peoples from across the globe migrated, to share in Nature's bounty. The Chinese were one such small group and contributed to the community with their industrious ways and a subtle spiritual and cultural centre, referred to as the "Joss House", but now more appropriately named as the "Innisfail Temple".